Although there is an increase, 70% of the students from classes VII to IX have learned division of three digits by one digit — much lower than the levels expected. As the Delhi government released the learning outcome data following the completion of Mission Buniyaad, they claimed that now 63% of the students from classes III to IX could read the grade-appropriate text and 71% could solve division. Although there is an increase, 70% of the students from classes VII to IX have learned division of three digits by one digit — much lower than the levels expected. The report notes that since more than “70% of the students of classes VII to IX can do division of three digits by one digit, these students are now ready to learn higher concepts”. 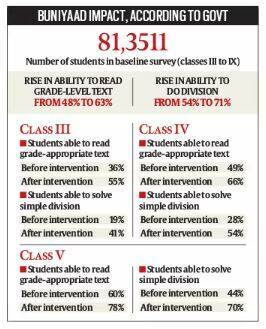 When the assessment was conducted, 56.3% students in Class VII could do division of three digits by one digit. That number increased to 72.4%. In Class VIII, the number jumped from 62.7% to 77.4%; while in Class IX it jumped from 65.7% to 79%. In overall improvement, there has been a 48% increase in reading Hindi/Urdu text. For mathematics the jump is of 54% — a total of 1,18,687 learnt to read grade appropriate text and 1,40,560 learnt math. Mission Buniyaad was part of the second phase of Chunauti scheme 2018, run by Delhi government in its schools for children between classes III to IX to improve learning levels. In 2016, the Chunauti scheme was started for students between classes VI to IX, but this year the ambit was extended to cover children in the primary section and the programme was also carried out in schools run by municipal corporations.